The sun streams through the large front window, and there are white cloths and fresh flowers on the tables. 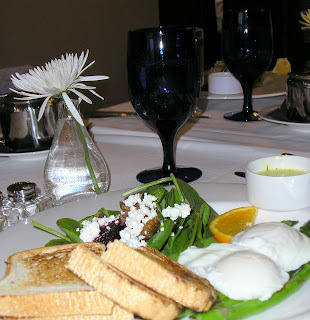 The menu tempts me with poached eggs over asparagus or French toast with caramelized apples and pears. Poached Breakfast Bistro at 259 Second Avenue South is an oasis of tranquillity and luxury in an otherwise workaday world. The restaurant at 259 Second Avenue South has a split personality. Flint Saloon opened four years ago and offers a wide-ranging drinks menu, cheese and charcuterie plates. It is open from 4 pm to 2 am daily. 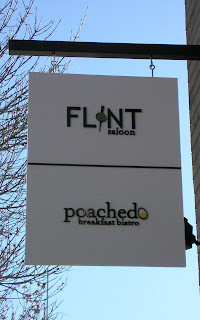 Poached Breakfast Bistro opened in July of 2010. It’s open from 8 am to 2 pm from Wednesday to Sunday. 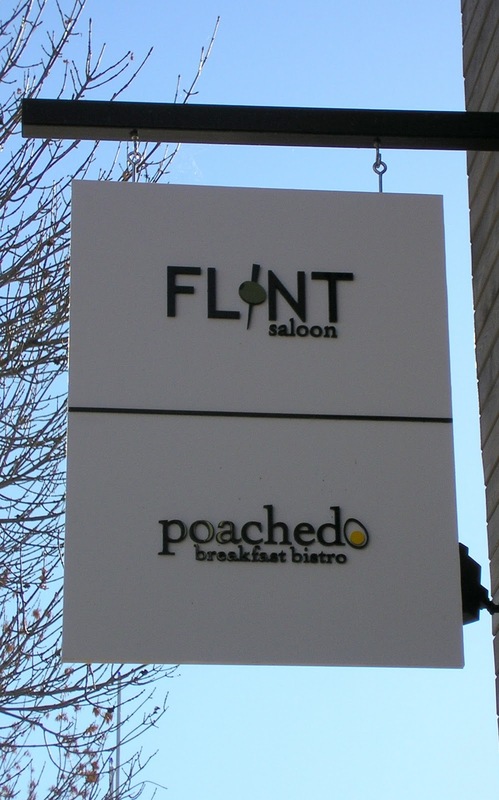 Chad and Mark Gabruch, the owner of Flint, had talked about opening a breakfast bistro for a number of years, but the idea didn’t come to fruition until they had to open up the restaurant early one morning for a photo shoot. They took a look around them and realized that it would be a great place to do breakfast. They discussed the menu and how they would organize the kitchen, and their plans were well underway by the time the photo shoot was over. “We’re really one company with two different brands,” Chad explains. The two restaurants have distinct personalities. The tablecloths and fresh flowers are replaced by larger, square table tops, funky candleholders and very different music when Flint moves in. And yet, the dual use of the space has encouraged customers to patronize both restaurants, which might not otherwise have been the case. “We try to offer dishes that didn’t seem to be readily available in Saskatoon – things like poached eggs over asparagus,” says Chad. My favourite dish on the menu is the French toast filled with caramelized pears and apples, brandy, maple syrup and brie. Chad says one of his favourite dishes is the eggs benedict: “The hollandaise sauce with dill and parsley is amazing.” He also recommends the breakfast plate with potato croquettes made in house, pecan-maple syrup bacon rollups, two eggs your way and salad fixings on the side. Chad says that he likes to switch the menu around frequently. The spring menu will be lighter than the winter menu with some lunch-style offerings of sandwiches and salads. Chad is also hoping to identify more local suppliers and fine tune some of his offerings. Chad grew up in Wakaw. After working in Calgary for a year, he moved to Saskatoon and took a travel and tourism course before working for WestJet for four years. He hadn’t worked in the food industry, but he loved food and restaurants. “I felt I could do it,” Chad says. “It would be a massive learning experience, but that’s what I was craving.” The challenges have been offset by the satisfaction of knowing that the majority of people who come through the restaurant have very positive things to say about it. Chad says that he has a great staff. They get along well together and share the same idea of what they want to achieve. “I’ve tried to adapt the WestJet management system,” Chad says. “It’s all about approachability. We’re working in a very confined space, so we need to resolve issues immediately.” Chad believes that there’s a way to be fair to everyone; the policies and procedures aren’t set in stone. For example, Chad gives staff a say in who they work with, in terms of both the schedule and new hires. I adore "Poached". Must try that fantastic looking French Toast!